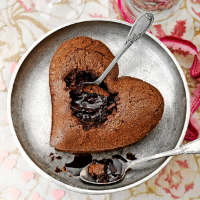 Show you really care this Valentine’s Day by making this deliciously oozy, heart-shaped chocolate pud. Best of all, there’s more than enough to share. Preheat the oven to 180 ̊C, gas mark 4. Put 1 tbsp cocoa, 2 eggs, 2 egg yolks, 3 tbsp caster sugar, 3 tbsp plain flour and a pinch of salt in a food processor with 100g each melted unsalted butter and dark chocolate; whizz until smooth. Tip into the mould, tap on a surface to even out and bake for 20-22 minutes, until risen. Cool in the mould for 2 minutes, then turn out and serve with crème fraîche, if liked.